Old-Fashioned Motherhood: Traditional Homemaking Skills: Are They Relevant Today? 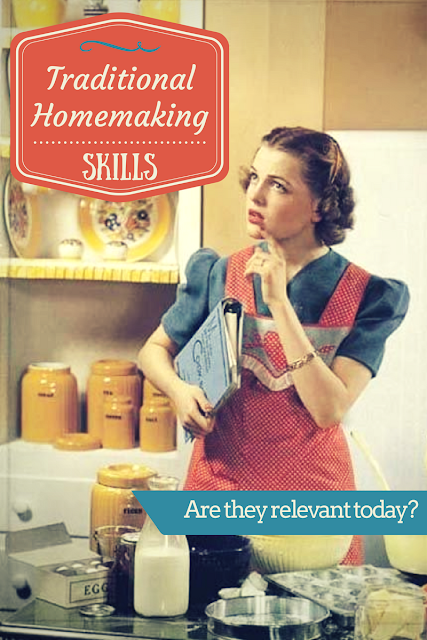 Traditional Homemaking Skills: Are They Relevant Today? It's been more than six years since I wrote THIS, and yet it's still the most read post we have here at the Old-Fashioned Motherhood blog. 1) We live in a day when most things are temporary. In the modern world, we might wonder why we should repair clothing, or cook meals at home when we can get a new outfit or a delicious, warm meal by driving down the road and spending relatively little money. 2) We are becoming more dependent upon large corporations and government agencies. I continue to ponder about my appreciation for the ease and comfort of our modern world while still yearning for the strength and liberty that hard work and self-reliance generate. So while a cake mix is much easier to make than baking a cake from scratch, processed foods will never be as healthy to eat as home-baked creations. The same can be said for produce we buy verses the gardens we grow, and businesses we create as opposed to corporate or government jobs. Everything has a price; so has our convenience come at the cost of our independence? It is a paradox, for sure, but can a balance be found? I believe that this is one of the biggest challenges of our day and age! 3) We are losing vital skills that will not be easily found if they are ever needed again. This concern was the catalyst that drove me to create this blog back in 2007. I took a good, hard look at my mother and grandmothers, and realized that they had a wealth of homemaking knowledge that I would most likely never have in my lifetime. While I am so grateful that I have not experienced the hardships that my fore-mothers have faced, I feel the loss of their skills as a nagging concern in the back of my mind. In an article from the U.K. website DailyMail back in March of 2012 (See a more easy-to-read version here), they present the findings of a study done among younger women with regard to their homemaking skills. Beyond baking pies, if our delicate technology one day fails, will I know how to wash clothes with little water and no commercial detergent? Or bake bread without electricity? Or sew clothing for my children to wear? I do not wish to be an alarmist, but I DO want to be prepared! And so I learn about solar ovens, and homemade laundry detergents, and how to store large amounts of water. I think of the time I spend studying and learning about self-reliance to be insurance against the possibility of future troubles. 4) The connections between mothers and children are becoming weaker as mothers outsource instruction to others. Our grandmothers and great grandmothers learned vital homemaking skills by assisting their mothers in their own homes. For most of families in modern society, this is no longer the case! As a teenager, I remember asking my mother if she thought I should take a Home Economics class for one of my electives (this was in the 1980's). She laughed and said that she and her sisters used to think their Home Ec. classes in high school were ridiculous because they could do so much more than they were ever taught in the classes at school. My grandmother had taught them all to work and care for a home from the time they were babies. Unfortunately, I was personally so busy rehearsing in plays and choir concerts, that there were many basic homemaking and cooking skills that I never learned by the time I had a home of my own to run. I did eventually learn all I needed to know for my homemaking career, but it took many years of trial and error to be the homemaker I am today. While I am extremely grateful for the vast amounts of information and support now available online, there is something a little sad about learning to cook a roast from a stranger rather than to learn how one's mother, grandmother, and great-grandmother cooked their own. I can't help but feel that something gets lost from our family cultures and traditions along the way. I mention all of the above, simply to say that I truly believe that traditional homemaking skills are not only relevant in today's world, I feel they are VITAL for the future of society. First of all, we can ASK. We can text, email, or even call, our mothers, aunts, grandmothers, cousins, or sisters, and gather their recipes, hear their stories, and get together to share stories, memories, and food. One thing I did do before I left home was to copy all the recipes my mother had gathered from her mother, aunts, sisters, and grandmothers over the years. There is a special feeling knowing that I am making the same salad my grandmother brought to every family gathering over the years. Secondly, we should share what we have learned with our own children. We can take time to let them help us prepare a meal or a special treat. We can work together with them in the home, garden, and yard so they learn how to care for the things they are blessed with. We can spend less time running around, and take more time to be together at home, as a family. Imagine a world where homemakers and mothers everywhere come together to support and encourage one another as we "preserve and promote the skills and ideals of the traditional homemaker-mother." Picture a future where our children and grandchildren connect with parents, aunts, uncles, sisters, brothers, cousins, and grandparents so they can pass on those traditions that will keep their own families vibrantly cared for and nurtured at home. I so agree with you Mama Rachel! When I see women, especially LDS mothers praised and vaunted for worldly achievements in sports or the corporate world I wonder what their homes are like. In all the years I've been a mother (27) I've never once needed to know all the finer points of soccer, basketball, etc. But I've had to put three meals a day on the table, make five Halloween costumes each year, and keep my family healthy and clothed, my home clean and orderly. It is the career I've chosen and I do it out of love and pride. I suppose others chose a different career and are only part-time homemakers and mothers. It is a collective loss to society and a personal loss to specific children. Thank you for encouraging the maintenance of old-fashioned choices, practices and skills. Your righteous influence is needed in today's world. Thanks for posting this one and I so agree with all of it. I am truly worried that someday we may need homemaking skills. I wonder what will happen if we can't buy clothes are material or what if we cant get soap. My Mother made soap when I was young. So many things that our children do not know how to do. I did teach them many of the arts but I know that in general they don't cook from scratch and there are other skills they don't do. Also, I feel sad that even an ironing board and iron are not used much anymore. We are such a casual society. Blessings and Hugs for this one! Agreed... although I am sure I am not skilled enough. The art of making a home is important to independence and thrift and ties generations together.